Gene and protein expression and profiling provide system level information to the understanding of their function. Modern biology and technology advancements have led to quick generation of large amount of Omics data, readily available in various data formats from Microarrays, CHIP-Seq, RNA-Seq, Proteomics by Mass spec, Yeast Two Hybrid, and other high throughput methods. The large amount of data as well as their different/non-uniform formats(e.g. 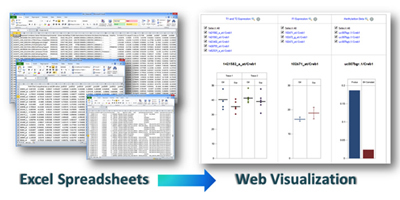 as excel worksheets) and annotations have make it a time-consuming job to generate meaningful interpretations for target gene/protein of interest. BxGenomicDB is specifically designed by Omics experts for the bench scientists to build their own online omics database, and to search, analyze, visualize and graph their target gene or protein function faster. Time savings: Quickly search for genes based on name, pathway, expression value, statistical value, etc. Discover the hidden treasures in your large omics dataset quickly with BxGenimicDB today! Contact us today for a demo and find out how to build your own online genomic database and find out target gene/protein function quickly across different experiments. To order, simply fill out the quotation/order form and submit to: order@proteinct.com. Orders can be placed by phone, email, fax, or online with a formal PO (Purchase Order) . You may contact us anytime for assistance.